This lesson begins by having students explore how maps can help them imagine, record, and remember journeys. They discuss how journeys may take place in the physical world or in the imagination. 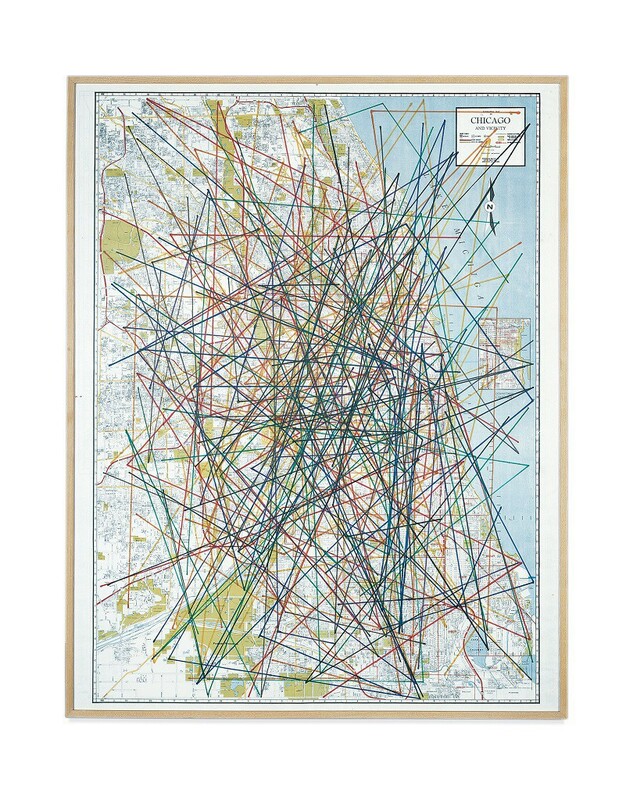 Then students analyze John Cage’s A Dip in the Lake: Ten Quicksteps, Sixty-two Waltzes, and Fifty-six Marches for Chicago and Vicinity, an artwork for which Cage used a map of Chicago to create an unusual score for a piece of music. Students read informational texts about the artwork, listen to an interpretation of the score, and discuss how exploring an artwork is another way to take a journey. As a culminating activity, students create maps for their own imaginative journeys. No specific background is needed for this lesson. How can we represent or record the journeys we take? The journeys we want to take? How can artworks simultaneously represent, record, and inspire journeys, both real and imagined? A map can help us plan, record, and remember a journey. A journey can change how we see ourselves and the world, whether it is a physical journey or a journey of the imagination. A close reading of a work of art can take us on a journey of the imagination. Students will cite specific textual evidence when speaking to support conclusions drawn from a text. Students will integrate and evaluate content presented in diverse media and formats, including visually and quantitatively, as well as in words. Students will prepare for and participate effectively in a range of conversations and collaborations with diverse partners, building on others’ ideas and expressing their own clearly and persuasively. Use a map to discuss journeys: Display a map for students, such as a map you have posted on the wall of your classroom or a projected image of a world map. Ideally, this should be a physical map, not a political map, with terrain (mountains, rivers, etc.) indicated. Invite two volunteers to each pick a spot on the map, perhaps somewhere they’ve been or somewhere they’d like to go. What will we encounter along the way? What boundaries will we have to cross? How will we travel? On foot? By public transportation? By boat or plane? Ask students if it’s possible to take a journey without physically going anywhere. Point out that they have just done this. They took a journey by looking at a map, analyzing the information, and picturing the journey in their minds. Have them discuss the differences between traveling somewhere in your mind and physically traveling to a new or different place. Discuss a quote about maps: Read the following passage by Ken Jennings. Jennings, who is widely known for his record-breaking wins on the trivia game show Jeopardy, has been a self-proclaimed “map nerd” since he was a young child. In the quote below, he describes why maps fascinate him. What is Ken Jennings saying in this passage? Summarize his statement in your own words. According to Jennings, what two kinds of places can maps reveal, and why does he believe this is important? What do you think Jennings means when he says that maps also help us understand “the way to get back home”? Can “home” be something other than the place where we live and where we keep our belongings? Describe what “home” can be. How can maps help you imagine a journey? How can they help you record a journey? How can they help you remember a journey afterward? Are you more attracted to places that are nearby or faraway? Places that are familiar or unfamiliar? What makes you say that? Where does your eye travel when you look at this map? Where did you look first? Where did you look next? What specific details drew your attention? Why? If you had to give someone instructions for how to use this map, what would you tell them? What do you notice that nobody else has mentioned yet? What kind of journey do you think this map could represent? Guide students to look closely at the artwork: The following questions are designed to be open and inquiry-based. There are no right answers, nor is there a prescribed direction that the conversation should take. Let the dialogue flow naturally, following your students’ interests and inquiries. What do you notice about the lines? Describe them. What is similar about the lines? In what ways are they different? What do you think is the purpose of the lines? Have you been to any of the places on this map? Where are we located relative to this map? Imagine you were traveling along a route outlined here, as we did with the other map. What do you think you might see along the way? What title would you give this artwork? Why? Is your title based on what you see, what you think the work might be about, something else? If the artist who made this were here right now, what questions would you ask him or her? To what extent was this description connected to the way that we described this work of art? Give some examples. What observations did we make about the artwork that aren’t included in this description? According to the text, how does this artwork suggest a dance? This artwork is considered to be a musical score. How do you think someone could “read” this score and make music from it? What was unusual about the instruments that John Cage used in his compositions? Imagine that you are attending a performance of 4’33. What would your reaction be? Why? How did Robert Pleshar “perform” A Dip in the Lake? What did he learn from the experience? How did other artists imagine that they would perform A Dip in the Lake? Reread the last sentence of the text. What do you think the writer is saying? What evidence in the text supports your ideas? Listen to a musical interpretation of the artwork: Robert Pleshar’s recording of A Dip in the Lake can be accessed at http://www.ubu.com/sound/cage_dip.html. Play a few minutes of one of the sections, such as “Marches 1-28,” and invite students to share their reactions to the piece. What do you recall about our first conversation about this work of art? What did we notice just by looking at it? What did you learn about A Dip in the Lake by reading about it? How did listening to part of Robert Pleshar’s performance of A Dip in the Lake add to your understanding of this work of art? John Cage didn’t explain how to use the score he created. He left it open for the users (the choreographer, the musician, the listener, the performer) to imagine their own way to bring it to life. If you were going to “perform” this score, what would you do? How is exploring an artwork like a journey? Have students create a map of a journey: Tell students that they will now make a map of a journey they’ve taken or one they would like to take. The journey can be close to home, such as a bus trip to and from school, or to a distant place, or to a place in their imagination. They can use their creativity in deciding how to depict this journey—for example, they might incorporate found objects or create a 3D representation of the map. Invite students to share their maps and discuss how they depict unique journeys. Quicksteps involve a quick two-step motion. Waltzes follow a three-step pattern: one-two-three, one-two-three. Marches command four steps: one-two-three-four, one-two-three-four. Give students time in or out of class to plan, practice, and then perform their choreographed pieces. Jennings, Ken. Maphead: Charting the Wide, Weird World of Geography Wonks. New York: Scribner, 2011.